George Xu and Jason Deatherage discussing the Piercing Cloud Method. Swordsmanship can only ever be a direct experience, and its central essence can only be obliquely approached through forms and lineages. 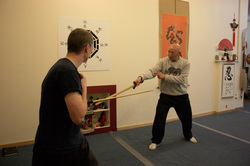 The training of the physical techniques of the sword is a relatively simple affair, but it is the mind that is the critical element in the development of one's relationships with the sword and the world. Furthermore, one must truly begin to drop their perceptions of separation in the world, eventually dropping the separation between one's training and the rest of their life. The Piercing Cloud School studies the principles of the sword through various sword traditions, including those of the Chinese and Japanese cultures. Fully engaging in deeply traditional work with the Chinese Jian, Broadsword, Two-Handed Jian, and the spear, as well as the Japanese Katana, Jo and spear, Piercing Cloud is a deeply incisive method of learning the use of weapons in the old Taoist traditions. Besides cultivating high levels of combative efficacy with various weapons, Piercing Cloud brings a deeper level of engagement with the present moment and all of the benefits that such mindful awareness lends to one's relationships with not only one's opponents, but also 'real life'. The study of the Sword provides us with a wonderful paradox of compassionate and courageous communication set against the efficient use of sword as a killing tool. Only by breaking down the separation between these two states of mind can we begin to approach a truly complete and effective use of the Sword, whatever our original goals. Piercing Cloud can be applied to any existing weapons system to deepen the student's engagement with the principles of swordsmanship, enhancing the study of their own art without breaking or contradicting it. The Piercing Cloud School can also train you in any of several traditional weapons styles, both Chinese and Japanese, as well as provide instruction in meditative practices and Taoist practical philosophy. Our various instructors bring a vast depth of experience and a broad cross-section of styles together in an atmosphere of sharing and learning. From lightning flashes of insight to long years of deep training, Piercing Cloud never ceases its deep inquiry into the principles of the Sword.